The native form of this personal name is Lukács Pál. This article uses the Western name order. Paul Lukas (May 26, 1894 – August 15, 1971) was a Hungarian actor. He won the Oscar for Best Actor for his performance in the film Watch on the Rhine (1943). Lukas was born Pál Lukács in Budapest into a Jewish family, the son of Adolf Munkácsi and Mária Schneckendorf. Ha was later adopted by Mária (née Zilahy) and János Lukács, an advertising executive. His major film success came in Watch on the Rhine (1943), where he played a man working against the Nazis, a role he originated in the Broadway premiere of the play of the same name in 1941. His portrayal of Kurt Mueller, a German émigré with an American wife, played by Bette Davis, was universally lauded by critics. Brooks Atkinson of the New York Times, wrote, "As the enemy of fascism, Mr. Lukas' haggard, loving, resourceful determination becomes heroic by virtue of his sincerity and his superior abilities as an actor." He won the Academy Award for Best Actor for the role, winning out over luminary efforts as Humphrey Bogart in Casablanca, Gary Cooper in For Whom the Bell Tolls, Walter Pidgeon in Madame Curie, and Mickey Rooney in The Human Comedy. He also received the New York Film Critics Award for his performance. 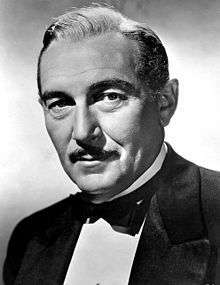 In 1943, he guest starred as the eponymous character in an episode of the radio program Suspense, "Mr. Markham, Antique Dealer". On April 2, 1944, he starred in "The Steadfast Heart" on Silver Theater. Modern viewers also remember Lukas for his role as Professor Aronnax in Walt Disney's film version of Jules Verne's 20,000 Leagues Under the Sea (1954). By that time, however, he was, at age 63, suffering from memory problems during the production, apparently leading him to lash out at cast and crew alike. Even friend Peter Lorre was not immune to the abuse. Lukas was honored with a star on the Hollywood Walk of Fame at 6821 Hollywood Boulevard on February 8, 1960 making him one of fewer than a hundred Oscar-winning male actors in Hollywood history to receive a star. ↑ "Sunday Highlights". The Nebraska State Journal. April 2, 1944. p. 28. Retrieved March 31, 2015 – via Newspapers.com. ↑ According to the featurette "The Making of 20,000 Leagues Under the Sea" on disc 2 of the Special Edition DVD release. ↑ Obituary Variety, August 18, 1971, page 55. ↑ "Paul Lukas". Hollywood Walk of Fame. Retrieved 3 October 2015.